A space that is entirely dedicated to components and spare parts for under sink reverse osmosis equipment. Always efficient systems for excellent quality water. 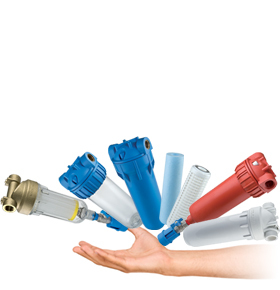 The RO VESSEL housings are some of the components offered for reverse osmosis home systems. The cartridges kit dedicated to pre-filtration. The remineralizing filters IN LINE AIM are designed to remineralize osmotic water. The activated carbons filter IN LINE AIC is one of the components dedicated to reverse osmosis systems. The 1812 type reverse osmosis membranes are highly performing membranes, specifically designed for domestic uses. The storage tanks for filtered water are some of the components for reverse osmosis systems.